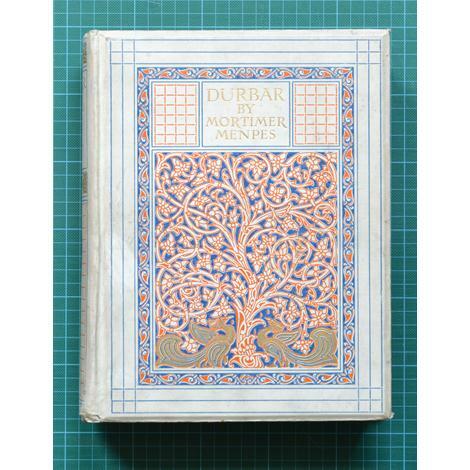 In 1902, Menpes embarked on a lengthy journey, visiting - amongst other places - Burma, Egypt, Kashmir and India. In 1903, he and his daughter, Dorothy, followed the earlier success they had enjoyed in producing a lavish travel book (Japan, a Record in Colour, published in 1901), with a magnificent illustrated volume, The Durbar. A limited, signed, edition of 1000, printed at the Menpes Press, on vellum, and with decorative boards and spine, was published by A.&C. Black (shown here for reference). The principal inspiration for the book was to record the celebration, in Delhi, of the coronation of King Edward VII. But - reflecting Menpes' unbounded curiosity about other places and cultures - it is much more than that. It is an astonishing record of the people, the politics, the natural history and the geography of British India. 'Major Dunlop Smith ordered all the Baluchistan chiefs to be brought round to the .. camp. There were about a hundred of them, all dressed in white - morose, severe-looking people. They were the very last to give in to British rule, and they didn't look as though they had quite given in yet... They made a magnificent picture with their long jet black beards, and their dark and extremely handsome faces. They wore long white flowing robes, and looked almost like biblical figures. I was surprised to find that etiquette was a great point with these men. .. They would insist on being sketched each in his proper order. ... These fierce hillmen are inordinately proud of their personal appearance' (Durbar, p.150). Our large and very striking etching is of one of these chiefs. 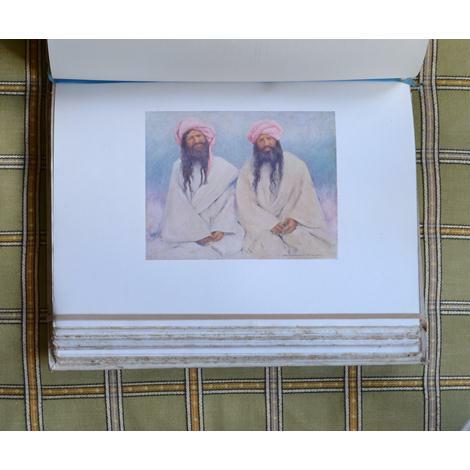 Menpes must have been particularly taken with his appearance, as he is also illustrated in The Durbar, as one (on the right) of 'Two Baluch Chiefs', 'wild, untamed men', with long beards and pale pink turbans (facing p.150, shown here for reference). This print is clean and has a clear signature. The sheet of paper has been trimmed, top and bottom. 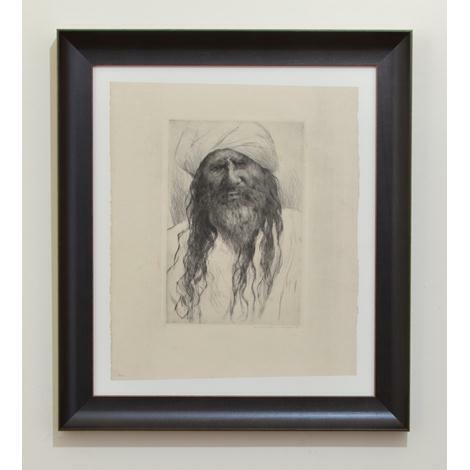 This image was included, as No.169, in the 1995 Sotheby's sale catalogue of, The Prints of Mortimer Menpes.